When Nanaimo City Council decided to cancel a leadership event – with just four days notice – because they found a couple of its participants offensive, church leaders feared that the decision would threaten religious freedom. Before long, the combative Toronto-based TV commentator Ezra Levant was raising money for a law suit. Back in Nanaimo, almost two months after their ill-considered decision, city council has backed down, to a degree. But they have not rescinded their original decision. A peace-making local newspaper publisher has made a constructive proposal and church folk seem ready to accept a just – and peaceful – resolution of the situation. The story began May 5, when an almost unanimous decision by the city council resulted in the cancellation of a contract related to a May 9 Leadercast presentation, with a soft Christian backdrop, to be run in the city-owned Vancouver Island Conference Centre. The 600-site simulcast, with a base in Atlanta and a location in South Africa featured speeches by such leadership gurus as Desmond Tutu, Andy Stanley, Laura Bush, Malcolm Gladwell and Simon Sinek. One of the sponsors of the American event, Dan Cathy of the Chik-fil-A fast food chain has supported pro-traditional marriage, anti-gay events. Henry Cloud, a psychologist who was one of the speakers, had, at one time, advocated ‘reparative therapy’ as a means through which homosexual urges could be subdued. City councillors seemed keen to outdo one another as they accused Leadercast speakers of several things, including acting “criminally” and harbouring “deep Christian” anti-gay values. The council discussion can be found here. (Go to 4:39 on the agenda to get to the Leadercast debate.) To see excerpts, surrounded by much bombastic commentary by Sun News Network commentator Ezra Levant, go here. 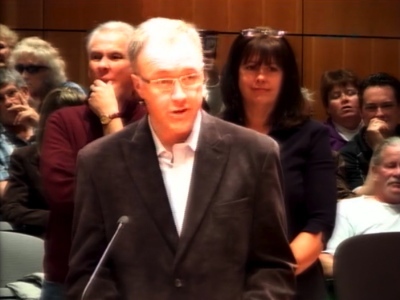 Ezra Levant pilloried Nanaimo City Councillor Fred Pattje (pictured in a video of council proceedings), and others, for their May 5 decision. The council decision video went viral and was turned into a national campaign by Levant, who quickly raised $5,000 for Calgary constitutional lawyer John Carpay to mount a lawsuit against the Vancouver Island city, if it did not reverse its decision. Three pastors who are members of the Nanaimo Evangelical Fellowship appeared before council June 16, urging the city politicians to apologize for cancelling the contract and withdraw the motion on which the cancellation was based. Pastor Darcy Siggelkow of Generations Church said he wanted to express thanks for their interactions with council, which he described as “cordial and constructive.” He added that several council members had apologized to him for the tone and the language of the May 5 debate. Yet this issue is a matter of public record, and the action of council on May 5th requires a public response. I want to be clear that we are not associated with Leadercast or its local sponsors, yet we find the content and the implications of the motion passed by council immensely concerning . . . It’s a serious matter in Canada to deprive citizens of freedom of religion, association and speech by refusing to grant them access to public facilities. Section 8 of the BC Human Rights Code defines this as discrimination. I want to make it very clear to council that as it stands the motion of May 5th could prevent many from being able to hold an event in a city-owned facility. 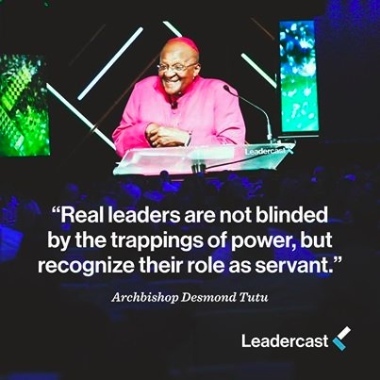 The context and the precedent established by the Leadercast motion will wrongly identify me as one who would promote divisiveness, homophobia and hatred – a grievous indictment. Council is not properly informed about the Leadercast events, but the real issue that brings me here today is that council is either uninformed or disregards the Canadian Charter of Rights and Freedoms . . .
To hold and express a different opinion on matters of marriage or sexuality is not hate speech . . . On the contrary, this is an example of thoughts, opinion and expression expressly protected by the Charter of Rights and Freedoms . . . I am not asking you to agree with or accept my opinions or beliefs. But as a Canadian, I am asking you to uphold my right to hold and express those beliefs, just as I afford you the right to hold and express yours. Nanaimo Daily News publisher Hugh Nicholson has stepped in to help resolve the dispute. 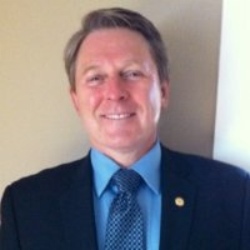 But it remained for Hugh Nicholson, publisher of Nanaimo Daily News, the main sponsor for the Nanaimo Leadercast link, to propose a way for the city to save face with the city’s Christians and allow free speech to prevail. With the permission of Leadercast’s central organization, Nicholson has approached the city with a plan: Allow Nanaimo to rebroadcast the video of the event on city property, likely the conference centre, place some advertising promoting the event and permitting the city’s public distancing from its previous decision, and charge no rent to the Leadercast sponsors. Nicholson also wants the kind of decision-reversal that would ensure that no anti-Christian, free-speech-inhibiting actions would occur in the future. As of Canada Day, Nicholson had not heard back from the city. Asked what would happen if the face-saving offer was refused, he suggested a privately-owned facility would be engaged for the day. Nicholson said the presence on the Leadercast speakers’ roster of Simon Sinek had been a major factor in signing up for the May 9 event. Sinek had spoken at an impactful Nanaimo leadership event a few months ago. 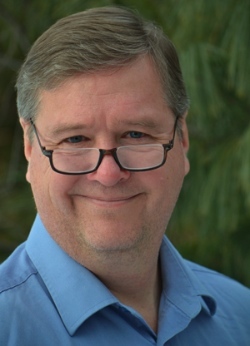 The Leadercast issue has drawn several responses, including a couple of insightful blog posts by Travis Barbour, associate pastor of the Neighbourhood Church, a Nanaimo Mennonite Brethren congregation. Barbour makes the point that both those who urged the council’s contract-breaking and Ezra Levant’s “rant” caused dissension through the dissemination of misstatements and exaggerations. Bruce Clemenger, head of the EFC, says local Christian leaders ate doing a good job responding to city council. The EFC was deeply disturbed both by the action of the council to cancel the contract and the rhetoric employed by some to support their lamentable decision. The Nanaimo Evangelical Fellowship should be congratulated on how they worked together, and the delegation commended on their representation to the council which resulted in some apologies being made and the council saying it regretted its decision. The council has acknowledged that facilities owned by the city should be made available to the various of groups and organizations that make up the community on an equitable and non-discriminatory basis. [The EFC] would make representations to the council only if asked by the Nanaimo Evangelical Fellowship (NEF). The NEF acted judiciously and was able to bring its concerns to the council and the council backed down. Where possible, it is best in the long run for these situations to be resolved locally by those who are part of the community. The next day of reckoning for city council is July 14, when it will deal both with the NEF recommendations and the Daily News proposal for settlement. For now, council has, as Clemenger pointed out, issued a statement that it regretted its decision and would likely not have taken that direction, had it given more consideration to all sides of the issue. And, it should be noted, as well, several council members indicated affinity with the Christian community in the midst of the debate, by attending a community prayer breakfast along with a few hundred other Nanaimo leaders. Mayor John Ruttan even read some selected scriptures to the crowd. When will leftist secular “human right” dud(e)s learn that they represent a most regressive and intolerant school of thought who are blind to the real nature of their own secular world view? It is time they examine their world view objectively. Actually, that is difficult to do. So, they need to hire a world view consultant to examine their intolerance and narrow mindedness. It always amazes me how they view their intolerance and narrow mindedness as progressive, open and broad minded. I simply cannot imagine that kind of blindness. On the one hand, I wish I lived in Nanaimo so that I could have raised hell. On the other hand, it is probably just as well that cooler heads than mine waded in to work out this problem. God bless them. 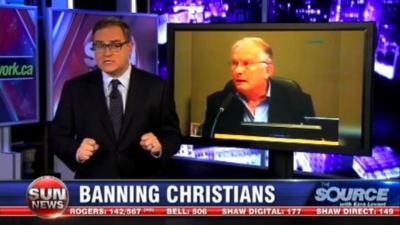 Christians on the Nanaimo Council ought to bow their heads in shame for their cowardice. Thanks for your post and for the link to my blog. I am so pleased to see this story receive some fair and balanced reporting. I have been following this with interest. The only way this issue can be resolved is for Nanaimo Council to rescind their motion which contravenes the Canadian Charter of Rights.